By Daniel Hirsch, M.D., Steven D. Herman, M.D. A 68-year-old diabetic woman presented to the emergency department complaining of a 1-day history of generalized abdominal pain, coffee ground emesis, and dark stools. She was found to be afebrile but hypotensive. Physical examination was remarkable for abdominal distention and generalized tenderness to palpation. Laboratory findings revealed leukocytosis. 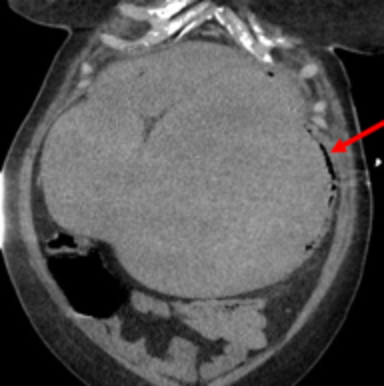 The patient was further evaluated with a noncontrast computed tomography (CT) examination of the abdomen and pelvis due to concern for diverticulitis or possible perforation (Figure 1). Gastric intramural air is a rare radiologic finding with causative etiologies ranging from benign and self-limiting to potentially lethal. It typically occurs when the gastric mucosa is disrupted, allowing for air to track between the various layers that compose the stomach wall. While different imaging modalities may reveal associated pathologic findings, CT is the most sensitive. Several etiologies of intraluminal gastric air have been described in the literature, and distinguishing between them is necessary as they are distinct pathologic entities with varying prognoses and management strategies. Gastric emphysema is often used to refer to a noninfectious source of intramural gastric air. 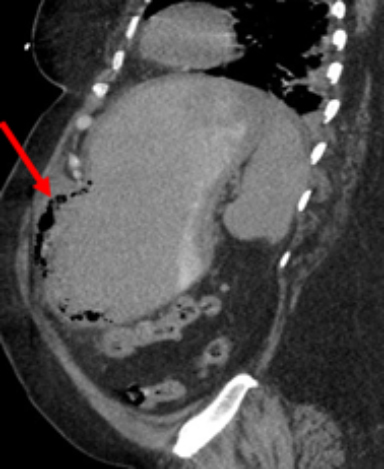 It is often seen in the setting of chronic inflammation such as gastroenteritis or any process with increased intraluminal pressure, including gastric outlet obstruction, small bowel obstruction, or forceful vomiting.2 As with emphysematous gastritis, these patients will demonstrate linear hypodensities along the gastric wall on CT, although there is typically no wall thickening or portal venous gas. It is primarily the clinical picture that differentiates the two entities, as these patients will often be asymptomatic and hemodynamically stable. Gastric emphysema is usually self-limited and requires no intervention. Many different iatrogenic or traumatic mechanisms have been described in the literature that may result in intramural gastric air, including nasogastric tube placement, laparoscopic gastric band erosion, and motor vehicle accidents.5-7 Additionally, ingesting caustic substances may damage the gastric lining, allowing for the presence of intramural air. While alkaline and acidic substances will vary in their mechanism of insult (ie, coagulative vs. liquefactive necrosis), they both result in mucosal damage and possible superinfection with gas-forming bacteria.8 Similar to emphysematous gastritis, hemodynamically unstable or rapidly deteriorating patients benefit from prompt surgical intervention, while stable patients may be managed conservatively. Air within the gastric wall does not necessarily have a gastric origin, as cases of air tracking from adjacent sites to include the gallbladder9 or bowel have been reported. A common nongastric source of gastric intramural air is from the pulmonary system. Several studies have described the presence of intramural gastric air in the setting of bullous emphysema, specifically after rupture of alveoli.10 This allows free air to dissect along the vascular sheaths and reach the paraesophageal space, ultimately tracking down and settling within the gastric mucosa. Patients in this category typically demonstrate no abdominal symptoms and the finding is often made incidentally. Due to the CT findings and the patient’s continued decompensation, she underwent a partial gastrectomy and focal areas of gastric necrosis were found. Both gastric tissue and peritoneal fluid samples were positive for Staphylococcus epidermidis and Entercoccus faecalis. Gastric intramural air is a rare but important radiologic finding that is best appreciated on CT. Multiple pathologic mechanisms have been described, each of which carries a different prognosis and management strategy. Familiarization with the various etiologies, as well as a detailed clinical history, is crucial in making the correct diagnosis and guiding appropriate management. The most severe form, emphysematous gastritis, refers to an infectious source resulting in the formation of gas within the gastric mucosa. If not promptly diagnosed and treated, it has a high rate of mortality. Matsushima K, Won EJ, Tangel MR, et al. Emphysematous gastritis and gastric emphysema: similar radiographic findings, distinct clinical entities. World J Surg 2015;39(4):1008-1017. Yalamanchili M, Cady W. Emphysematous gastritis in a hemodialysis patient. South Med J 2003;96(1):84-88. López-Medina G, Castillo Díaz de León R, Heredia-Salazar AC, et al. 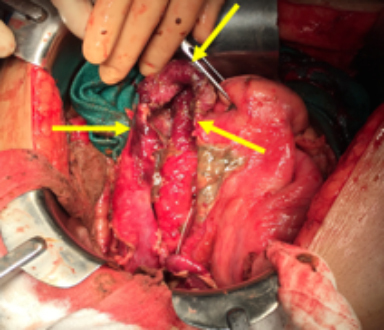 Gastric emphysema, a spectrum of pneumatosis intestinalis: a case report and literature review. Case Rep Gastrointest Med 2014;2014:891360. Kussin SZ, Henry C, Navarro C, et al. Gas within the wall of the stomach: report of a case and review of the literature. Dig Dis Sci 1982;27:949-954. Zenooz NA, Robbin MR, Perez V. Gastric pneumatosis following nasogastric tube placement: a case report with literature review. Emerg Radiol 2007; 13(4):205-207. Su MZ, Munro WS. Gastric emphysema secondary to laparoscopic gastric band erosion. Int J Surg Case Rep 2014; 5(10):727-730. Sen I, Samarasam I, Chandran S, et al. 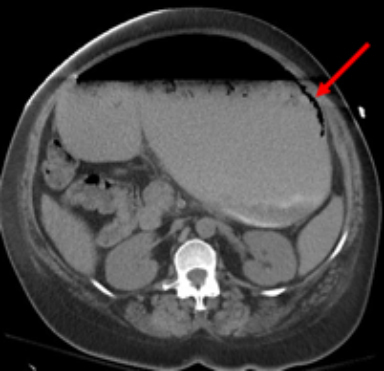 Gastric intramural and portal venous gas following blunt abdominal injury. Arch Trauma Res 2013; 2(2):95-96. Grayson DE, Abbott RM, Levy AD, et al. Emphysematous infections of the abdomen and pelvis: a pictorial review. Radiographics 2002; 22(3):543-561. Ocepek A, Skok P, Virag M, et al. Emphysematous gastritis—a case report and review of the literature. Z Gastroenterol 2004;42(8):735-738. Agha FP. Gastric emphysema: an etiologic classification. Australas Radiol 1984; 28(4):346-352. Hirsch D, Herman SD. Emphysematous Gastritis and Its Differential Considerations. J Am Osteopath Coll Radiol. 2017;6(3):19-21. Daniel Hirsch, M.D., Steven D. Herman, M.D. Dr. Hirsch and Dr. Herman work with the Department of Radiology, Hahnemann University Hospital, Drexel University College of Medicine, Philadelphia, PA.